The 24-channel PCM system is only the first, or primary, the order of digital multiplexing. 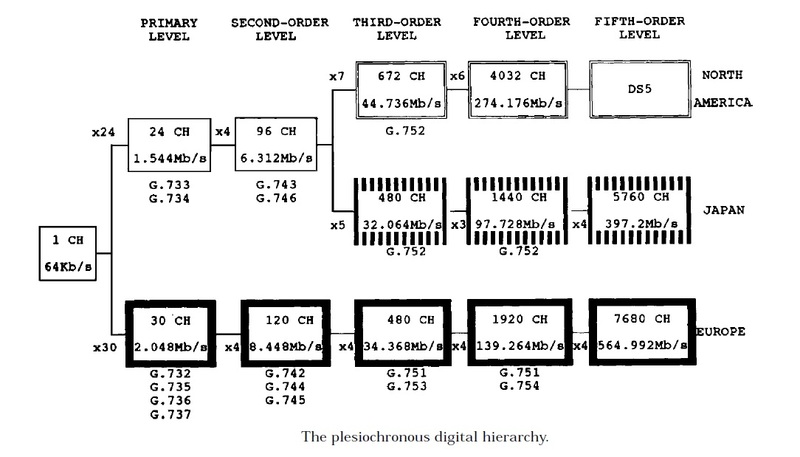 If it is necessary to transmit more than 24 channels, the system is built up as in the plesiochronous digital hierarchy multiplexing (PDH multiplexing) diagram of the figure. In the North American hierarchy, four primary systems are combined (multiplexed) to form an output having 96 channels. This is the second order of multiplexing. Seven 96-channel systems can be multiplexed to give an output of 672 channels (third order of multiplexing). Six 672-channel systems are multiplexed to give an output of 4032 channels (fourth order). Higher orders of multiplexing are now available, but all new multiplexers from the fourth order upward are synchronous digital hierarchy (SDH) multiplexers. Details of these higher-order PDH multiplexers are given in Table. Europe and many other regions of the world use the PDH hierarchy in above figure. In this hierarchy, four primary systems are combined (multiplexed) to form an output having 120 channels (second order of multiplexing). Similarly, four 120-channel systems can be multiplexed to give an output of 480 channels (third order). Four 480-channel systems are multiplexed to give an output of 1920 channels (fourth order). Four 1920-channel systems are multiplexed to give an output of 7680 channels (fifth order). All new multiplexers from the fourth order upward are now synchronous digital hierarchy (SDH) multiplexers. The approximate bit rate for each PDH multiplexer level is shown in the table.